Published on 9/29/2011 in Home Automation and Tech. 4 Comments Tags: BR30, bulb, CFL, Cree, incandescent, LED, light, low-voltage halogen, MR16, Philips, pot-light, remote-phosphor, track-light. Today I tried out two new LED lights. 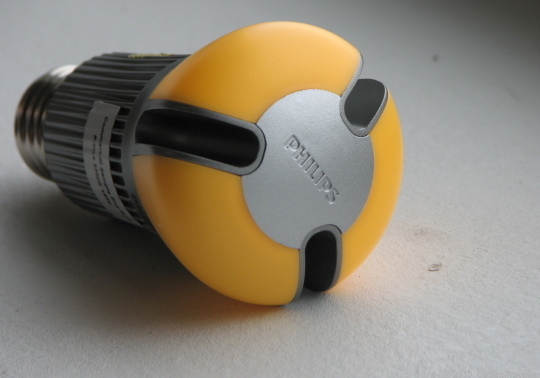 The first was a Philips AmbientLED in the MR16 form-factor, to work in my low-voltage tracklights. The second was a Cree EcoSmart CR6 pot-light. I’ve been experimenting with different low-power light options around the house. CFLs, dimmable CFLs, and most recently some Philips LED bulbs. Since so many of my switches have been replaced with X-10 or Insteon dimmer switches, I need bulbs that can support dimming, or at least not be damaged by it. The dream bulb would be something with the same colour-rendering and dimming behaviour as an incandescent, but still low-power. No low-power bulb has knocked my socks off yet, but the weird-looking one pictured to the right has come the closest. Published on 9/11/2011 in Home Automation. 8 Comments Tags: home automation, Insteon, KeypadLinc, SmartHome, template. For the KeypadLinc with clear buttons, SmartHome provides an MS Word template for creating your labels. I found it lacking in many ways. So, I made my own.